Understanding the need for effective communication of available data, School of Water and Waste organised a four day residential training onurban water and sanitation data management, analysis, visualisation and outreach.This joint training has been a continuation of our cross-cutting programme, comprising members from the Environment Resource Unit, Down to Earth, and Urban Water-Waste Management Unit (WUB). This training programme aimed at enabling participants to transform available data into effective stories which can influence advocacy and societal transformation. It was intended to further capacitate people already involved in information dissemination and outreach, as well as for those who wished to learn about it for future use.The four day training programme comprised interactive classroom lectures, presentations, case studies, group exercises, project works, shooting short videos and discussions. 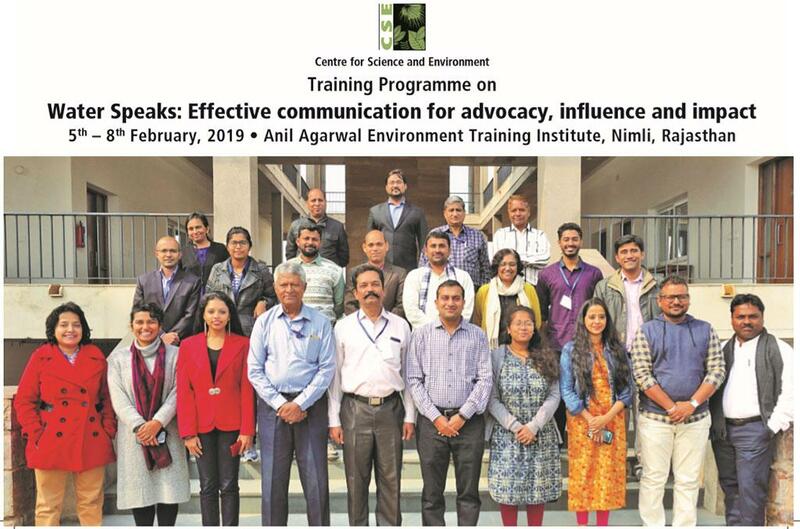 The training cohort constituted 19 individuals from diverse demographic and professional backgrounds working in the fields of water and sanitation.These included government workers (including those from SMART cities and Swachh Bharat Mission), students, faculty, NGOs, planners, journalists, and consultants. Day 1 began with an introduction to CSE and the need for knowledge based activism, and using information for societal change. RudreshSugam, Senior Programme Manager,WUB, discussed different aspects of current water management scenario, its challenges and opportunities. Kiran Pandey, Programme Director, Environment Resource Unit, followed this with why and how data becomes significant when discussing water situations globally. She was joined by RajitSengupta, Assistant Editor, Down to Earth, for sessions on finding relevant content for research and advocacy, how to smart search online, and conceptualising a story. The day ended with project work for participants on identifying the message which has to be communicated, and finding relevant information to convey this message. Day 2 saw Dr. D.D. Basu introducing the participants to statistics. Through examples on groundwater and rainfall data, he discussed the importance of presenting numerical data meaningfully. Rajit continued the day with interactive classroom presentations on writing effectively and data analysis for communication. Sessions on using mobile phones to create videos and photos for everyday stories and activism involved outdoor group exercises. Day 3 primarily comprised of sessions on data management and visualisation through demonstration of Microsoft Excel and PowerBI by our external resource person, Neeraj Kumar. He showed the cohort how these tools could help them manage big data efficiently and presenting it effectively. In the afternoon Aditya Sharma from the lab team gave the participants a tour of the green features at the AAETI campus. Rajit took the sessions forward by discussing different examples of visualising stories while Joyjeet Das involved the participants in lively interactions around social media outreach: what works, what doesn't, and the importance of clarity in your messages. The final day saw Kiran Pandey discussing how to create and maintain online identities. RudreshSugam added to the cohorts' toolkit by discussing GIS with them, and how it can help them manage their water related data. The training ended with the participants' group project presentations and assessment followed by feedback and felicitation. Yes I would recommend this training programme for practicing professionals in the management of government and business enterprises. My key take-away from here has been the visualisation and communication of big data. This was a well organised event! The facilities were really good. I would like follow up events similar to this training and e-learning modules as well. The sessions were practical and applicable to real-life projects. The course will definitely help the early stage career professional. I would recommend a follow-up training event to add to this learning. And an exercise on how the participants are using the learning in their work. The experience from Water Speaks will be used at Gramalaya. It was a nice course and I would recommend more elaborate courses on ‘framing it right’ with mobiles. The training and campus environment was very good, including the trekking. I will be using the PowerBI tool for data analysis and visualisation. This is an excellent place for trainings. The workshop was well organized. I learnt nuances of how I can communicate in more effective ways.